So I take it from the response on Friday’s post that pressure cookers are back, baby. Holy moly! I loved reading all of the comments. I learned so much and it’s made me excited to share some pressure cooker adventuring (like the dulce de leche I made on Saturday). I’ll try to post a few pressure cooker recipes each month (not to replace what I’m already posting but in addition to – shall we say Thursdays? Sure!) and update you when I’ve made a recipe from my site in the ol’ pressure cooker. But today, let’s talk about this lasagna recipe. 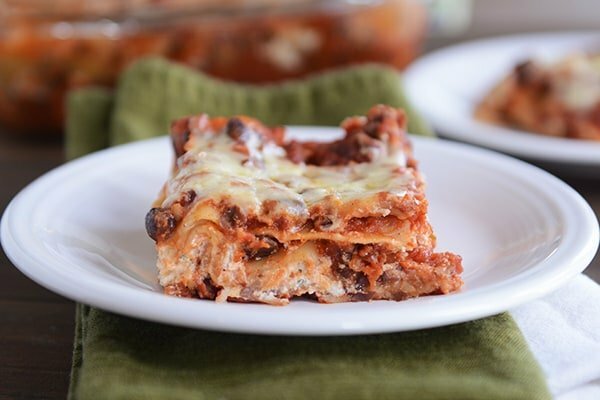 Not pressure cooker friendly (I don’t know, I suppose you could get all crazy and try it; at the very least you could get your black beans ready in a jiffy with the pressure cooker if using dried), this black bean lasagna has been a long time family favorite. I remember making it all the time for Brian’s sister, Amy, and her husband, David, when we lived in Northern Utah almost a decade ago and they had just moved there from Oregon. They were our dinner pals and I loved making food for them since my kids were all four years and younger and I was in those years of dinner time = food being thrown constantly on the floor while little Houdinis figured out how to unbuckle their high chairs/boosters. Feeding real, live adults was a pleasure (as long as they were ok eating amid the aforementioned chaos). 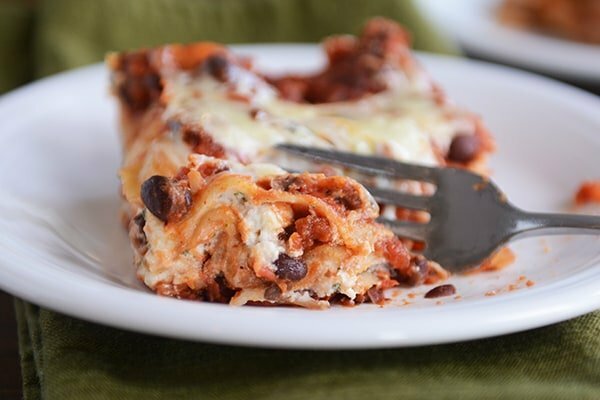 I’m pretty sure this cheesy black bean lasagna is still Brian’s favorite lasagna variation which is quite impressive since although he enjoys a meatless meal now and again, I don’t think he’s ever actually requested one besides this. He asks for black bean lasagna quite a bit, especially if we’ve been on a long run of bad dinner experiments. Those are never the best of times. While it doesn’t necessarily fit into any specific food category (not really all Mexican, certainly not 100% Italian), it’s a beautiful mess of smoky flavors, tender beans and lots of saucy goodness. Hearty, simple, and delicious. Oh, and don’t forget cheesy. Yum! Preheat the oven to 350 degrees F. Lightly grease a 9X13-inch baking dish. Set aside. In a large 12-inch nonstick skillet, heat the oil over medium heat and add the onion and garlic. Saute for 2-3 minutes until the onions start to turn translucent. Stir in the tomato paste, oregano, cumin, chili powder, salt and pepper and mix until the ingredients come together. Add the beans, crushed or diced tomatoes, and broth. Using the back of a spoon or a potato masher, lightly mash the beans. Bring the mixture to a simmer and cook for 8-10 minutes, stirring often. In a medium bowl, stir together the ricotta or cottage cheese, parsley or cilantro, and 2 cups of the cheese. Spread about 1/2 cup or so of the sauce mixture on the bottom of the prepared pan. Layer three noodles, 1/3 of the sauce mixture followed by 1/3 of the cheese mixture (just dollop it in spoonfuls, it doesn't need to be a completely even layer). Repeat two more times. Sprinkle the remaining cup of cheese on top. Cover with lightly greased foil and bake at 350 degrees for 30 minutes. Uncover and bake another 10 minutes until the edges are bubbling and the lasagna is heated through. Let stand about 10 minutes before serving. You can use either crushed or diced tomatoes - a lot will depend on how you want the texture of the finished lasagna to be (you could even use a 15-ounce can of each). Same with ricotta or cottage cheese. I've made this with both and when I use cottage cheese, I like to drain any excess liquid and lightly blend it (not to smithereens - just a few short pulses). If you don't have no-boil lasagna noodles on hand (I prefer the Barilla brand or the whole wheat ones at Target), you can use normal noodles but boil them several minutes short of al dente and pat dry before using. Really good! I’ve made this a few times. Once I used spaghetti sauce instead of the tomatoes and it was still great. I always forget to mash the beans and they are still great. Thanks so much Mel!!!!! Another awesome recipe from you!! Much appreciated!! Excited to have this on our menu this week! I am using crushed tomatoes…do I need to drain any liquid from them beforehand? Thanks! Big hit with everyone. Thanks Mel! I have heard of this, but never had the chance to taste. Maybe this weekend. Delicious spin on a meatless lasagna! And we had everything on hand — such a dream to make a meal like this just using stuff from the pantry and freezer. Perfect! So hearty that we didn’t miss the meat. I threw in some shredded zucchini too (drained off the liquids a bit) and it disappeared nicely in the sauce. I’m sure all kinds of veggies could go undercover in this one. 🙂 Thanks Mel! Have you ever made this ahead of time and frozen it? I freeze so many dishes, but wasn’t sure about the texture of the black beans after being frozen. I’ve never frozen this but actually I think it would work great. Hi Mel, I make this regularly for my meat-loving husband and myself. Obviously this makes a lot for just two people so I do freeze whatever is left after the first go-round. As with so many tomato-based meals, this is even tastier the second time. Honestly, I think the times the I pull this out of the freezer and gently reheat in the oven, it’s every bit as good as the first day. My husband, like yours, requests this meal, which always surprises me but he does really like it. I use the flat pasta sheets from Trader Joe’s and do not cook them first – there is enough liquid in the sauce and this turns out great. Delicious! Made this last night to rave reviews. Going on regular rotation. Thank you! With all those flavors mixed together, does the taste of the black beans get minimized? I would like to try this, but my daughter hates black beans. I know you said your hubby likes it, but what about your kids? I probably wouldn’t make this for a black bean hater. There are a lot of flavors going on but you can still taste the black beans (but yes, my kids gobble it up). This recipe delivered all the things I needed tonight when I made it for 3 families. Simple, delicious and didn’t require leaving my house or taking away from the grocery budget. Another winner and lifesaver Mel! You tried this so fast! I love it! You are a rock star for making it for three families! Mel does it again! Made this tonight and it was DELISH! Thank you! So happy you loved this Sarah – thanks for commenting back! HOMEMADE BASIL LASAGNA NOODLES? Sorry to shout but those sound too amazing for words. My sister the vegetarian will love this! I never would have thought t o put black beans in my lasagna! I’ll have to try this next time it’s on our dinner menu! If it wasn’t for the other half of that lasagna in my freezer, I would be adding this to my menu plan for next week. But alas, that would be too soon for my husband who is spoiled by variety and would question so much lasagna so often. 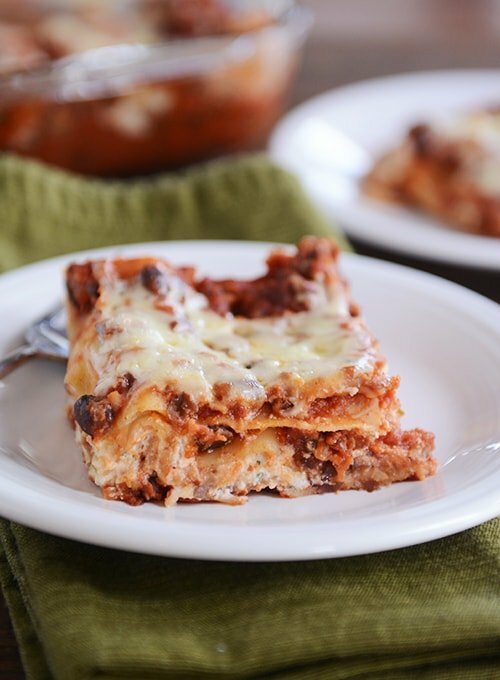 But this is the perfect time of year for it so I say: Bring on more lasagna! 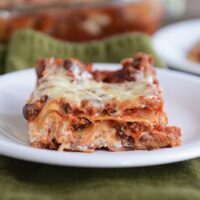 I love the idea of black beans in lasagna! Will be trying this ASAP. I assume you do not drain the tomatoes. Is that right? This looks tasty — I might even add in some diced green chilies because we love a little kick. But Thursday posts (on occasion)? That just has me giddy! One of my favorite early morning routines on Mondays and Wednesdays is to jump on your site to see what’s new. Adding another day, with recipes I can use in my pressure cooker? Awesome!! What Alicia said! – both the green chilies and Thursday = pressure cooker day. re Sheila’s comment about ricotta. I think you have a dog Mel – dogs LOVE whey (by product making ricotta) and it is good for them if they can have some dairy. You can give them a bit straight or dilute with water. I used it with my previous dog when he was ill to get him to drink more and lap up some supplements. The whey is also good as the liquid for bread making. And after ricotta – fresh mozzarella! It is a few more steps and you need citric acid and rennet but it is wonderful and fun to do. Great idea about the whey, Liz. We give Maggie extra kefir grains when we have them but I bet she’d love the whey. My Aunt just made homemade mozzarella and it has me excited to try it, too! Reading the flavoring ingredients in this recipe and then coming upon Aunt Marilyn’s name, I sat straight up and re-read the post again. Googling something totally unrelated a few weeks ago, I came across instructions on making your own ricotta cheese. I was quite shocked how easy it sounded and I could use the recommended milk bags from making your homemade yogurt. And it would cut the cost of buying ricotta cheese in half. I’m excited to try this new version of lasagna. Great minds think alike, Sheila! I’m making my own ricotta cheese this week (for a stuffed shells recipe), too. Mel, Will you be posting your homemade ricotta recipe? Please say yes. Sure! I’ll try to remember to take pictures and post it. Oh, I want your tried and true recipe so I’m holding off on trying homemade ricotta until you share. Exciting!